Ok, this blog may be a big gruesome, but I suspect there are people out there that want to know when the incisions are like. So I'm surprising myself by posting a pic of my belly right after surgery, and another more recent one. 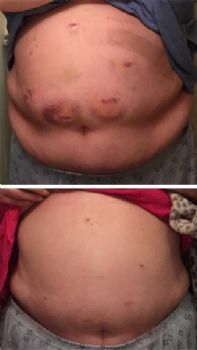 The first picture was taken a few days post-op, at home. I had no bandages or stitches to worry about. There was a clear coating over the incisions. They fell off on their own, one at a time. I wasn't allowed to wash my belly for several days, and I really wanted the adhesive off, but I was happy enough not touching the incisions. Please note that I was not in any pain. As the incisions healed, they started to itch a bit, but it wasn't bad. I'd had my gall bladder out many years ago, and had similar incisions. But that time they had stitches that needed to be removed. I didn't enjoy that, so I was very glad to skip that step this time around. That rounded rectangular spot on the top right was the cell phone's shadow. I had to bend backwards a bit for the send pic to avoid getting the shadow. What a difference! The incisions look different from what I imagined...you are healing very nicely! So the second pic was taken when? It's amazing how the body can heal. Thank you for sharing these photos. It really helps to have practical, reality-based information about what this process involves. Actually, that looks really good. I can't even see any scars on the tummy in the second picture ! Even right after surgery, it doesn't look all that traumatic. That's great that they can do that. Your incisions are healing up nicely! Tummy looks flatter too! Did you have gastric bypass? I had it 13 yrs ago, only I had the invasive one, it saved my life, went from 338 I'm down to 157, I still struggle with diet and exercise, but have managed to keep my weight down...kuddos!